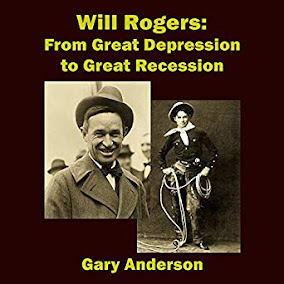 I showed in a recent article, entitled Hoarding the New Gold: Early History About Structured Finance, that the march towards diminished yields, in both good and bad times, corresponded to his tenure as head of the Fed. Alan Greenspan succeeded in his goal of stabilizing banking, pushing risk off the balance sheet of banks. 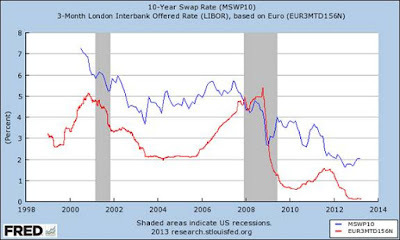 But he created an environment where bonds are hoarded, where bond yields relentlessly decline. He now looks at the system and sees the threat of hyperinflation. I think he is confused or perhaps conundrummed. I made up that word, but it could mean, being prisoner to your own plan, leading to massive confusion. More on that and hyperinflation later. We cannot blame the former Fed chief directly for the more recent creation of clearinghouses that have pushed demand for bonds up even more than thought possible. But clearly, they are an extension of the usage of treasury bonds as collateral in the derivatives markets that he fostered. If you want to make sure people have good collateral, you don't want to be dealing with an AIG, you want clearinghouses that verify the counterparty financial soundness. 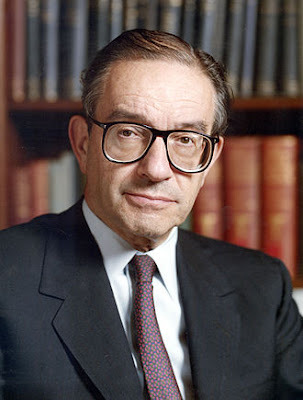 While I believe that Greenspan is sincere in his desire to see bond yields rise and the economy prosper, there is always that doubt created in my mind because he presided over most of the structured finance we see today. When the asset based structured finance (MBSs) failed in the housing crash of 2008, it became apparent that treasury bonds were the safest of all collateral. One could say that Greenspan's efforts to undermine that bond collateral by seeking higher yields is a conundrum in itself. It seems out of character for one so concerned about bank risk. Why would he want to destroy the collateral for the derivatives market he fostered? It makes no sense that he would want to saddle the big banks with even more risk and threat of margin calls. Maybe he has regrets about this system he was instrumental in creating. Or maybe Greenspan is just displaying a form of tantrum. There is evidence that efforts are always made to push long bond yields up, because the main players in bonds-as-collateral want to get the lowest price they can when they buy the bonds. A lower price relates to higher yields. Push yields up and you get your potential collateral at a much cheaper price. When the second set of Treasuries is issued, their prices and yields can be compared with the identical securities already trading in the secondary market. If there are pricing differences, that could be evidence of a problem. According to the plaintiffs, 69 percent of the auctions of reissued Treasuries from 2009 to 2015 appear to have been rigged, artificially boosting yields by 0.91 basis points. And I cannot tell you how many pundits, some who contribute to Talkmarkets, warned of rising interest rates after QE, and even the IMF warned of rising rates. Tyler Durden, who generously contributes lots off good information to Talkmarkets, was caught up in the rush to show how yields would go higher and spoke of an ugly week for bonds, reminiscent of the first taper tantrum in 2013. Yields have cratered since that Durden article. The truth of course is, QE tapering and the tantrums that followed were shortlived, and yields went down below where they were before the tantrums started. 10 year yield is about 1.49 percent. And certainly, if there is no bubble in the Eurozone, where long rates are often negative, the argument of the tantrumteers (I made up that word too), that there is a bubble in US treasury bonds sounds more and more like the boy who cried wolf. So, is Greenspan just engaging in still another tantrum, hoping to move markets a little bit so deals can be had? Seems like people are not even listening in the bond markets anymore. Please, understand that this argument I make, that there is no bond bubble in the US long bond, is not investment advice. I suppose there could be circumstances that would cause people to panic and sell out of the treasury bond market. But based on the laws of supply and demand for treasury bonds, over the last 30 years, the proof needs to come from the tantrumteers that we are really in a bond bubble for the 10 year long bonds. The only thing we can take from Greenspan's information that we know to be true is that low long yields stunt economic growth. I have been saying that for awhile, but it is nice to see someone as influential as Greenspan come out and speak the truth to that issue. The truth is, not only are savers hurt by lower interest yields, but I believe the Fed has lost the power to raise interest rates significantly, in order to slow down a hot economy. So, without that power, because the collateral is so important, the Fed cannot allow big economic growth. There are social costs to slow growth. Populist politicians in both parties want change. Efforts to shut down the government in the past threatens to weaken the credit worthiness of the United States. That would impact the collateral in the clearinghouses. And all this makes you wonder about why the architect of structured finance, Alan Greenspan, is taking the position he is. After all, he was for going back to the gold standard, not exactly expansionary, and warns of hyperinflation. But hyperinflation is usually associated with wars, and the inability to tax the population. There are plenty of people who could pay taxes in the modern western economies if they were not so busy hiding money offshore. And, while hyperinflation is associated with the inability to convert cash into gold or silver, the truth is, treasury bonds are rated higher than gold itself in the derivatives markets as collateral. You can convert your cash into treasury bonds, and it is better than gold itself. Does Alan Greenspan have no faith in the system he created? Is he getting nervous? Yes, he says he is. If he is opposed the very system he created, you wonder why he created it in the first place! Greenspan has acted like he does not want people to be taxed. That is the general libertarian/objectivist position. Ayn Rand was adamant in her loathing of taxation. But surely he knows this position is what leads to the hyperinflation he fears so much. And, by the way, hyperinflation is not caused by careful expansion of the money supply through helicopter money when you are experiencing negative rates. I do not know why so many financial insiders believe hyperinflation and helicopter money must be joined at the hip. Helicopter money would result in greater prosperity, leading to more taxable income for the government. So many monetarists seem to ignore Milton Friedman and fall back on their libertarian/objectivist/austere/liquidation roots. Libertarians are liquidators as have been Fed leaders. Hopefully that is not what Greenspan is peddling, but I not convinced otherwise.